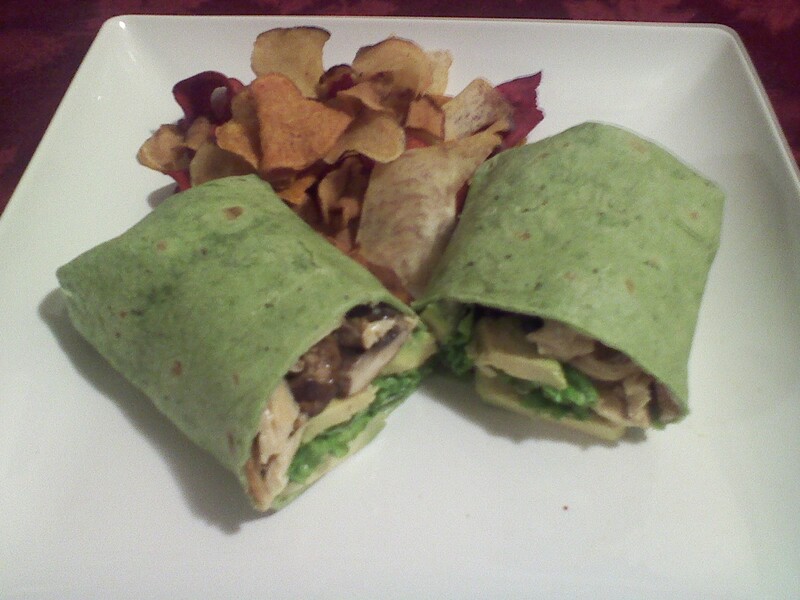 For dinner I decided to make a spinach wrap with toasted garlic mayo, chicken sautéed in mushrooms, topped with lettuce and avocado, and accompanied by Terra Veggie chips. Simple yet delishes and satisfying. I think wraps are great options if you’re in a hurry or just want something easy for lunch or dinner. You can fill them with anything you would like all you need is a little creativity. That sounds delicious. One of my favorites to make is a chicken Caesar wrap, but I’ll spread hummus on the wrap first, then build the filling. My favorie wrap is from a restaurant… I’ve not been able to duplicate it in my kitchen (I attribute this fact to the restaurants reputation for having THE FRESHEST seafood ever… and I’ve got slim pickins for fresh fish in my neck of the woods). Anyway it’s grilled yellowfin tuna sliced and wrapped up with black beans, lettuce, and a fresh mango salsa…. and there’s some kind of sauce- ay yi yi it’s so good!